The robotic 'hands' of NeuroArm are rock-steady, and can move in much smaller increments than a human being's hands. Last week, NeuroArm was used to remove a brain tumor from the patient Paige Nickason - a first. The human hand can steady itself and move in increments of one or two millimeters. NeuroArm can move in increments of just fifty microns. A micron is one millionth of a meter. Also, NeuroArm's robotic 'hands' can operate in the brain in a way that is less invasive and more delicate than a surgeon's hands. 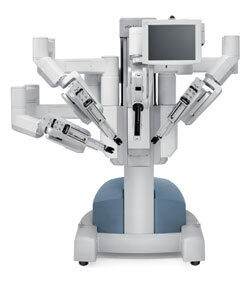 NeuroArm is not an autonomous robot; it operates under the direction of physicians using remote controls and an imaging screen for close work. If I recall correctly, Robert Heinlein thought about tiny waldos that could be used to perform surgery a few years later.